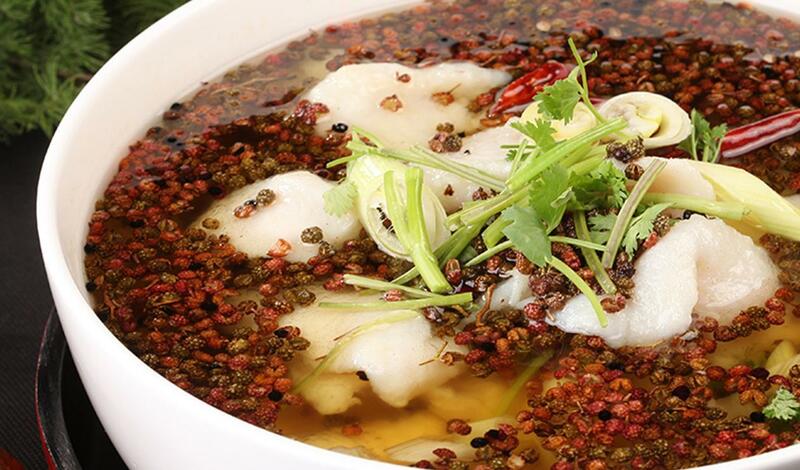 This spicy authentic Chinese fish stew gets heat from Sichuan peppercorns and aromatic flavors from ginger and spices. Cut the fish into 1-inch pieces. Put the fish pieces in large bowl; add cooking wine, cornflour and salt. Mix thoroughly and set aside to marinade for about 15 to 30 minutes. Cook mushrooms (or preferred vegetable) in boiling salted water. Place the vegetables on deep service platter. Heat vegetable oil in wok, add star anise, cassia bark and cardamom pods to stir fry for around 2 minutes until you can smell the aroma. Discard the cassia bark. Add garlic, ginger and white part of scallions to stir-fry for 1 minute. Add half of the Sichuan peppercorn and half the dried chili peppers to stir-fry until aromatic. Add doubanjiang and dou-chi to stir-fry for 1 minute. Add prepared Knorr® Ultimate Fish Base to wok and bring to boil, then add 1 Tbsp salt. Add the fish pieces and cook just until the fish turns white. Add the cooked mushrooms to the stew. Transfer all the contents to a serving bowl. Heat 1 Tbsp vegetable oil in wok then add the remaining Sichuan peppercorns and chili peppers for the garnish. Finally top with remaining chopped (green) scallion then sesame seeds.